At the end of the Eighties, sport bikes had become inaccessible. The average enthusiast simply couldn't lay his hands on one of these hyperstyled chunks of misplaced ingenuity. As the decade ended, escalating prices and lack of consumer interest had plunged the Japanese and American two-wheeler markets into disarray. Feeling the ground shift under them, the major manufacturers desperately searched for a successor to the super-sport bike, for some concept that would start a new fashion capable of reversing the situation. Rarely have so many advanced studies and prototypes been created behind closed doors in the design studios. 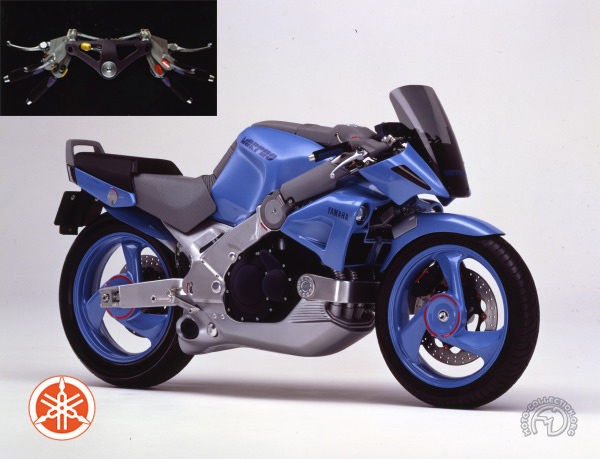 At the 1989 Tokyo Show, Yamaha unveiled the Morpho, designed for them by GK Dynamics. While this "glimpse into the future" was still aggressively sporting, the idea was that it should be capable of responding to the mood of its rider, with handlebars that could be raised or lowered and adjustable seatback and footrests. Morpho's frame was a massive cast- aluminium beam with the silencer incorporated in the engine cradle. The carefully coordinated pastel color scheme was a chic contrast to the usual bright primary colors used on sports bikes.